A deck-building game of perilous paths and rewarding riches. The Quest For El Dorado is a deck-building racing game. 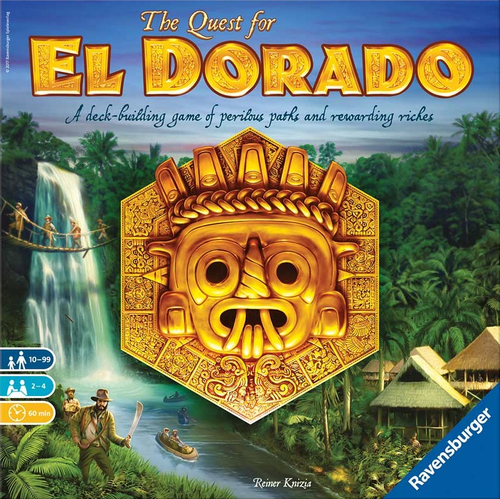 The object of the game is to be the first player to negotiate through the jungle to El Dorado. Along the way players will cross 3 types of terrain. Each terrain type requires different types of cards to move onto and across. A turn is a typical deck-building turn where you deal yourself 4 cards from your starting deck and use them to either move across the board or to buy a more valuable card to add to your deck. The jungle is made up of a starting board and an ending board. In between are up to 8 double-sided jungle boards. These jungles boards can be arranged in any course configuration. The course can be short and not too challenging, or long and nastier. There is a unique twist to the way additional cards come into play through the game. Each player’s starting deck is comprised of 8 cards – 3 explorers to move through the jungle, 1 suitor to cross water, and 4 travelers to cross deserts. These cards can instead be used to purchase additional cards from the card marketplace. The card marketplace contains 18 different types of expedition cards; each in its own stacks of 3. Only six of these stacks will be active and available to purchase from. As a stack is depleted, the next player to buy a card can choose to purchase a card from one of the 12 inactive stacks thereby, making it now one of the active stacks. 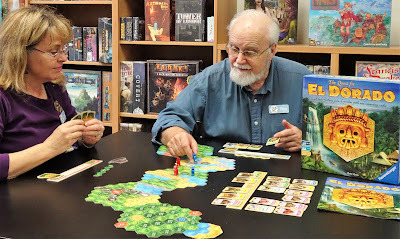 The Quest For El Dorado is easy to teach and is entertaining to play. The various board configurations that are possible can make it as easy or as challenging as the players want. Some boards are definitely harder to get across than others. The game also includes a variant where caves can be explored along the way to acquire special abilities. You may have to slow down to do the exploration, but remember it is a race. The Quest For El Dorado made the top three nominations of all the games submitted for the 2017 Spiel des Jahres (Game Of The Year) award. We have an open copy of The Quest For El Dorado available for you come in and try.